Another sweet treat from Istanbul that is so unique to this country – the Dondurma (turkish ice-cream). Dondurma in Turkish translates literally to Freezing. It is made of milk, sugar, salep and mastic and originate from the Turkish region of Kahramanmaraş. Two qualities distinguish Turkish ice cream: texture and resistance to melting. Inclusion of the thickening agents salep, a flour made from the root of the Early Purple Orchid, and mastic, a resin, impart chewiness. So unlike ice-cream which melts easily especially in the hot summer of Istanbul, this ice-cream can last quite some time and it tasted very chewy, unlike the cold wet texture of typical ice-cream. The most famous ice-cream from Kahramanmaraş is sold by a ice-cream chain throughout the country called Moda. At a later part of this trip, we will be sharing more of our experience eating the original famous Moda ice-cream from Kahramanmaraş. In Istanbul, you will see lots of pushcarts selling so-called Kahramanmaraş ice-cream – most likely they are just normal Turkish Ice-cream but still as yummy. 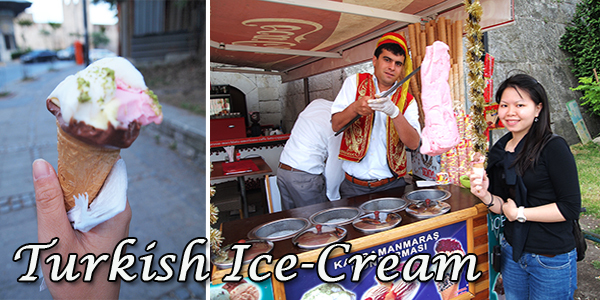 A ice-cream cone of 2-3 scoops cost about 2.50 TL – not very cheap but worth the experience and to further get more bang out of your buck, you should go to pushcarts with a bell and the seller dressed in bright red Kahramanmaraş ice-cream seller costume. Why? – because of the interesting and fun performance though not for the faint-hearted if you get frightened easily – see video below for more info. The bell is to distract you while the seller carry out all sorts of little tricks for an entertaining sell. Don’t be shocked when you see the pushcart ice-cream seller pull out a huge lump of ice-cream for show – this further demonstrates the elasticity nature of this unique Dondurma Turkish ice-cream (see picture above). I am a big foodie, I love all kinds of junk food and that too when it is the case with chocolates and ice creams. I have always tried to cover all the different flavours available. The Turkish ice cream is even more amazing than it looks in the image. Though it is expensive, after you have it, you just feel it is worth it. Yes Hannah. I love the ice-cream. It still find it yummy and really miss the Turkish ice-cream. I didn’t have the ice cream , but viewing the video , I would like to have it when I go to turkey. I wonder if we get the Turkish ice cream any where else here. It looks yummy , and I want to taste it a little sooner from now.